A new report from TrendForce subdivision WitsView now suggests that LCD displays, specifically televisions, will likely rebound in 2018, possibly making up for declines over the course of 2017. Specifically, although shipments during 2017 are expected to have dropped by 4.1-percent year-over-year, next year they could increase to 218 million. That’s around a 3.9-percent growth, which WitsView attributes to increases in demand driven by the price points LCD televisions sale at as compared to entry-level price points for newer technologies. In fact, prices have dropped by an average of more than 17-percent since quarter two, and sales are further driven by yearly sales periods in China and elsewhere. As to which companies are likely to benefit the most, Samsung will remain at the top, WitsView says. 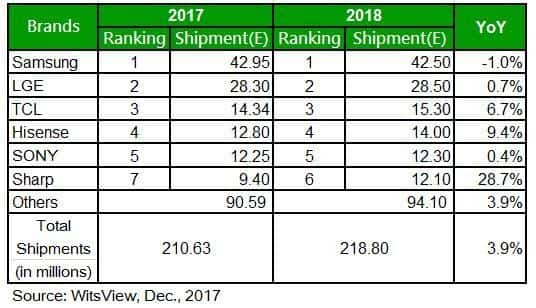 That’s despite a 1-percent decrease in shipments – with the expectation that sales from 2017 to 2018 will fall from 42.95 million units to 42.5 million units. On the other hand, television shipments for TCL, Sharp, and Hisense are expected to continue rising at an accelerated rate. Furthermore, for TCL and Sharp, that rate is expected to be primarily driven by the structure of the businesses themselves, which focus on the vertical integration of both assembly and brand with other companies. According to WitsView’s analysis, LG Electronics will maintain its second-place ranking, moving 0.7-percent more units in 2018 than in 2017. That’s followed by TCL, which is expected to move 6.7-percent more units. Hisense maintains its fourth-place positioning with a 9.4-percent increase in shipments, while Sony also retains its position with a 0.4-percent increase in shipments. Sharp, however, is predicted to see a massive 28.7-percent increase in shipments of its LCD panels for televisions year-over-year, moving the company from being ranked number 7 to the sixth position. None of that is to say that LCD TV shipments will overcome trends set by OLED, or Samsung’s QLED, televisions and the temporary increase in sales should probably not be viewed as a resurgence of older technology over the steady ingress of new TVs. Those newer panels saw an increase of around 72-percent in 2017 from 2016. Companies making those displays, meanwhile, are expected to report another increase in the sales of those in 2018. The trend is expected to continue as prices fall with a rise in demand for LCD televisions and as manufacturers continue working to move all production to OLED panels. LG intends to again start producing their own processors? You are reading an article on the LCD TV Shipments to Rebound in 2018 As Prices Fall. All materials on the site Gadgets F, а также и статья LCD TV Shipments to Rebound in 2018 As Prices Fall - written for the purpose of information enrichment and we are happy if you like our magazine.